We noticed that Peanut had a slightly awkward gait shortly after she joined our family when she was just two years old. As a pup, it made her more impossibly precious. Now? Not so much. The misalignment has progressed over time and has caused a number of issues with her shoulder and wrist, so we’ve been back to the drawing board several times in attempts to address the problems. We finally found a regimen that seems to be working well for us that includes a combination of in-office visits and home exercises. Through the years, we’ve gotten a number of consultations and tried a few different treatments. An animal neurologist suggested that it could be a neurologic disease or tumor, and the only way to know for sure would be an MRI. Since the problem had been getting slowly worse through the years, we decided it was likely not cancer and opted to not put her through the MRI procedure. Watching the problem slowly but surely progress, I sought out local rehabilitation centers to see what, if any, treatments might help out our little buddy. While there were a few different treatments to choose from, we decided to first go with K-Laser therapy. The goal is to reduce symptoms of pain and immobility by promoting circulation and decreasing inflammation. During the treatments, the technician repeatedly stroked the laser wand over the affected areas. For Peanut, this was her hips, knees, lower back, and wrists. While it was not a miraculous turnaround, I did notice some improvement which was encouraging. 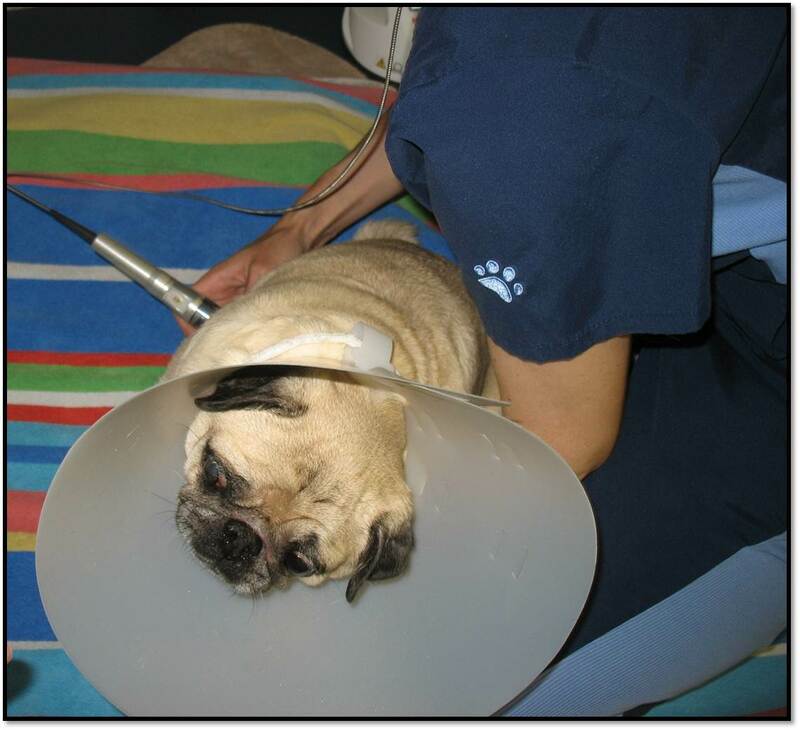 Here Peanut is receiving laser therapy. The treatments don’t hurt at all, it’s just that mummy’s little lamb chop sometimes gets a bit nippy. 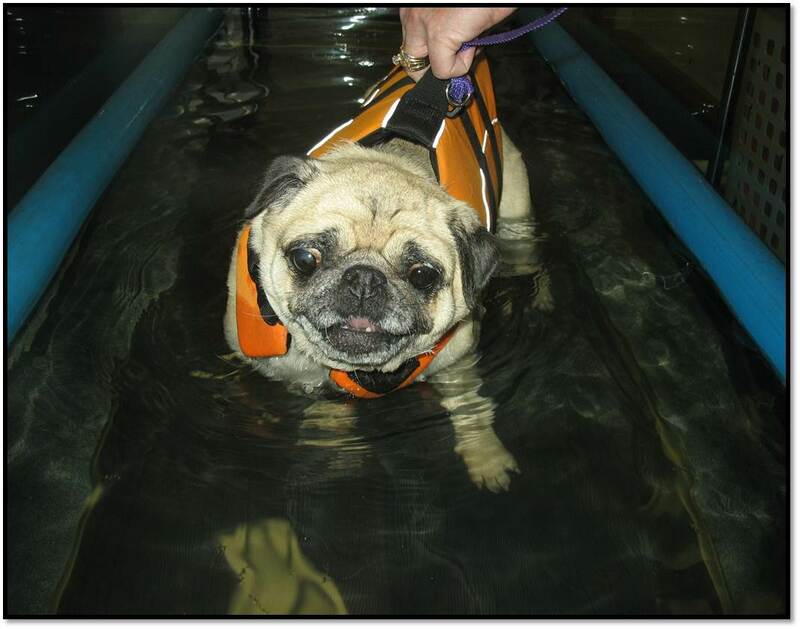 After completing the recommended dosing of laser therapy, we switched to Alpha-Stim treatments coupled with water therapy. 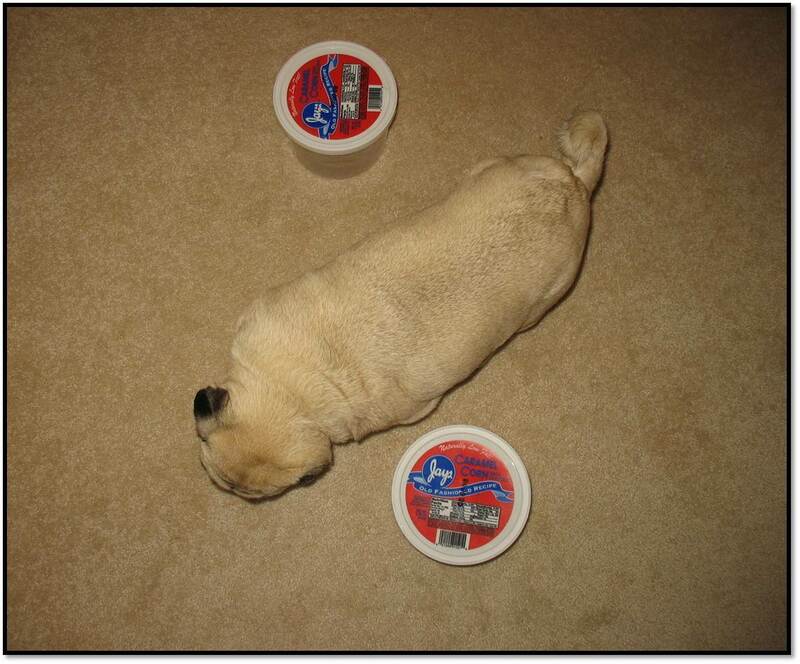 We were told that neurological issues were generally more responsive to this method, so this different approach would allow us to observe whether or not one method was better than the other for treating Peanut’s issues. We did not observe any noticeable results at all however, so we stopped after three treatments. The Six Million Dollar Pug: Better than she was before. Better… stronger… faster. We have since switched back to laser treatments twice a month coupled with monthly chiropractic adjustments as well as daily at-home exercises. Because I have seen noticeable results from the laser and the adjustments, I think it is worth the effort to continue treatments. I’m all for diet, exercise, and medication alternatives whenever possible, especially when medications have serious side effects. Note: These were recommended for us. Please consult your veterinarian or a licensed animal physical therapist to ensure that any exercise you do with and for your pet aside from standard day-to-day activities and play is appropriate. 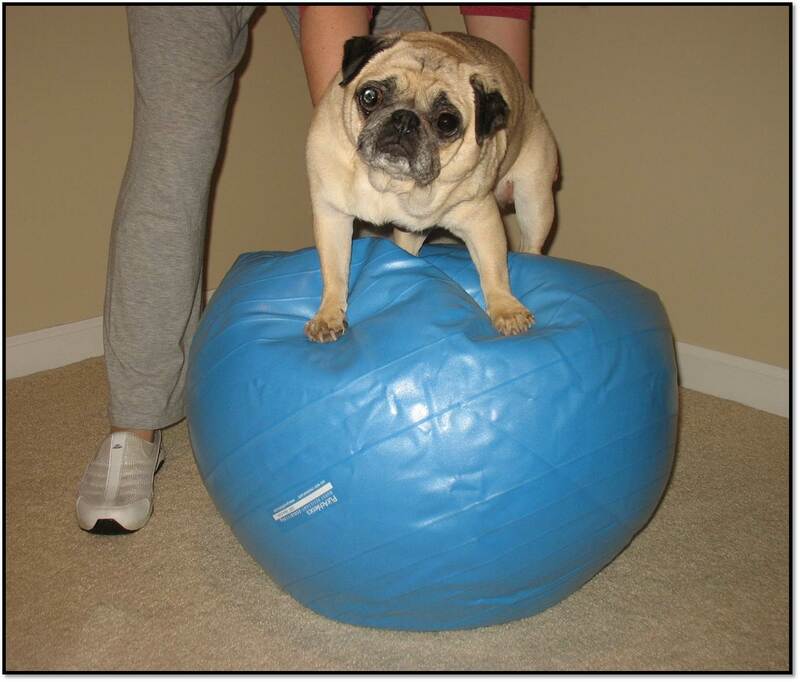 The canine physical therapist gave us a series of daily exercises to perform at home to help strengthen her weak spots. We were met with some resistance when we tried to recreate the setup. Seeing as “Good girl!” is not nearly enough of an impetus to obey our commands, we learned that to get cooperation, we had to pay the pugnacious pug price: popcorn. Daily step-overs (or what has become gallop-overs) to force Peanut to deliberately coordinate the lifting and lowering of the legs. We needed some type of long pole to lay on the floor for her. We just happened to have a whole bunch of snow brushes that fit the bill, so that is our completely sane and reasonable explanation as to why there are four snow brushes lined up on the floor of a carpeted storage closet. If we don’t do this exercise by noon, she will remind me that she needs therapy (read: popcorn). All I have to do is walk over some poles for popcorn? Ha HA! Suckers! I could do this all day! Figure Eights Another exercise designed to help the deliberate coordination of movement and force her to put more weight on her bad side to build up strength. I don’t understand this one. Walking around in circles? Can I just have the popcorn? Treat Ball Knocking the treats out of the ball with her paws is great for coordination as well as general stimulation. 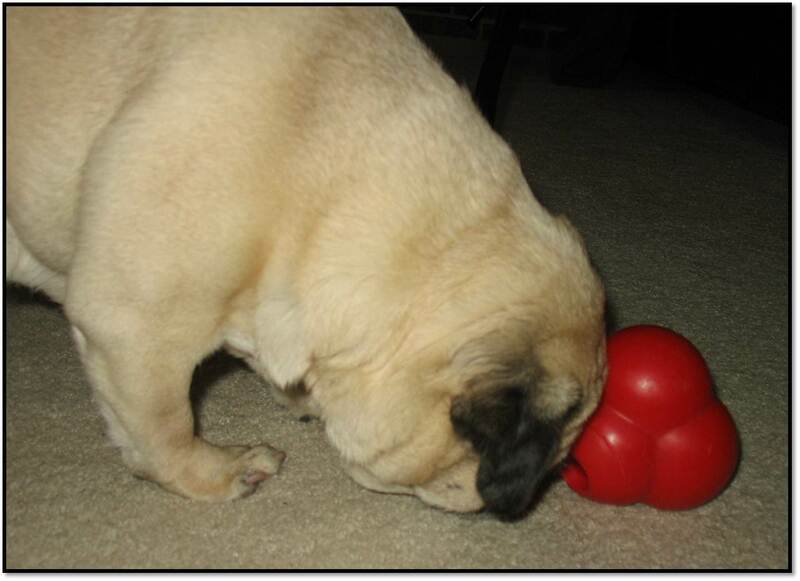 Knocking treats out of the ball is awesome until that last one that never seems to want to come out. I’m going to stop and stare at it now until you help me get it. Meh. Giving this half a kernel is generous. This one’s just weird. As an added benefit, these exercises and activities seem to do as much for her mentally as they do physically. Next on the list to troubleshoot is loss of hearing! I have already started teaching her sign language. Our very first sign that took no time at all to learn? BONE! Curious about the sign language. Could you elaborate a bit? How and what are you teaching? Thanks! I’m so sorry to hear about Rosie’s fall! I hope you are finding rehab options that work for her. I’m not sure if Peanut just makes it easy on us or not but she has picked up sign language rather quickly. I think repetition, consistency, and rewards are the key, as there is always something rewarding at the end of learning anything new. I held up a bone and said “bone” (so I had her attention), made a rough bone-sized outline around my mouth, did that a few times, and then gave her the bone. I repeatedly did this each time. Now all I have to do is the hand signal around the mouth and she starts barking in excitement. I did something similar for therapy. I made an up/down motion with my right arm while saying “therapy”, did that a few times, and then proceeded to do the therapy (which includes lots of treats). All I have to do now is the arm motion and she gets excited for therapy. I gave up on teaching her lunch and dinner because she’s on to me to the second I go towards her bowl. 🙂 I think any unique gestures to indicate a walk, car ride, time for bed, etc. could be accomplished similarly. Thank you for reaching out and GOOD LUCK to you and Rosie!! I’m enjoying your stories about Peanut! 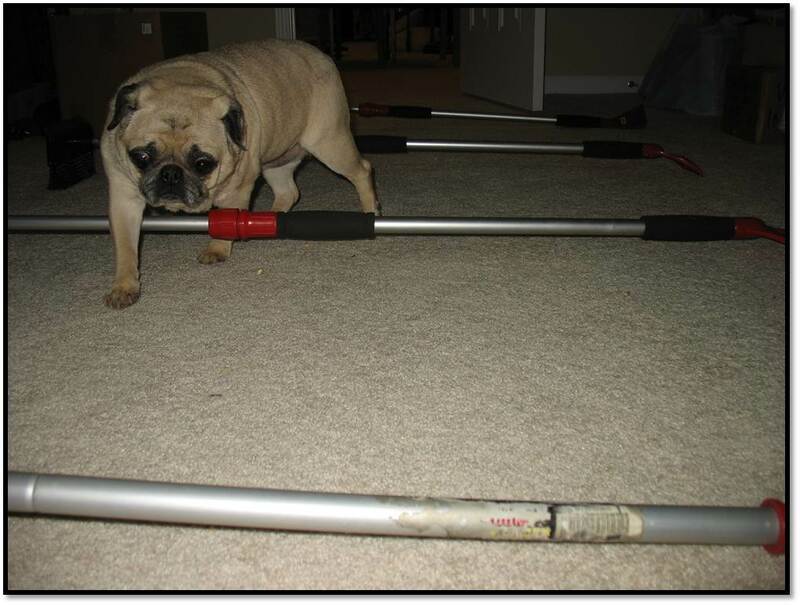 She reminds me so much of my PugnXi, also 13 years old and losing back end use. She’s also going deaf and food-obsessed.